A fatu bangi — literally, “fat bench” — is a piece of roadside furniture commonly found along major thoroughfares in Suriname, especially outside Paramaribo. Often made from rough planks or pieces of scrap wood, the fatu bangi is a location for relaxation, conversation, observation. 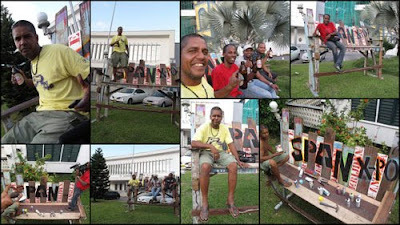 Roberto Tjon A Meeuw’s SPAN project is a series of fatu bangis positioned in and around the chief SPAN exhibition venue, the Surinaamsche Bank building on Henck Arron Straat. Roberto’s fatu bangi becomes part of our vernacular visual vocabulary. He articulates this through his T-shirts and through his found-object sculpture. The artist works with what we either discard or disregard. His work taunts or makes fun of our self-conscious and conservative tendencies; our limited notions of respectability and self-important seriousness. A fertile tension between the formal and the informal plays out in his work. On the surface, this may look like good old boy-fun, prankish and irreverent, but on another level it is a serious investigation of the relationship between our ideas of artistic expression and the popular. On my first visits to Suriname, I was taken by the design of these benches and the way they allowed people to spend the evenings looking out at the cars and other people going by. Is sitting on this bench sleepy indolent native behaviour, or is this active and agentive identification and engagement of community and the world around us? I was intrigued by their modest and practical design. But the last place one would expect to see a fatu bangi is downtown in front of the bank. Placing a fatu bangi here relocates the bank and the bench. It talks about the bank’s relationship to contemporary experimentation and enquiry and the everyday. It alters the value we place on this type of bench by seeing it in this location. One looks out at the world from a fatu bangi. Maybe also to be span.